Broken Tooth? In Pain? We’re Here to Help! Maybe you’ve suddenly tripped on the sidewalk and chipped a tooth, or maybe a dull discomfort in the back of the mouth has suddenly blossomed into searing pain. No matter what the specific circumstances are, every dental emergency patient has something in common – they need help NOW. At Santavicca Dental Professionals, we understand that these situations are never convenient or timely. Nonetheless, we’re fully committed to your health and wellbeing and will accommodate emergency situations as soon as possible. New and current patients are both welcome, so please don’t hesitate to contact us in Lebanon, NH for further assistance. 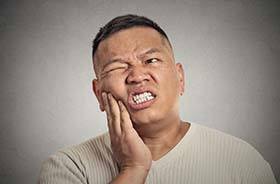 Physical injuries can result in a variety of dental emergency situations, including fractured teeth, damaged restorations like crowns or bridges, or even fully knocked-out teeth. If the entire tooth or any significant portions have come loose, we strongly recommend gathering them and placing them in a container of milk until you are able to see us. Alternatively, an entire tooth can often be gently placed back into the socket and held there for optimal results. Please keep in mind that the window for successful reattachment after this type of injury is very slim – only around an hour. Here in Lebanon, our team will start by relieving any severe pain before working closely with a patient to determine the ideal reconstructive solution for their injury. 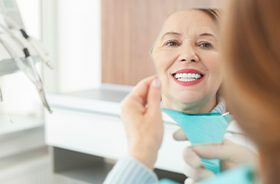 New fillings or dental crowns may be the best choice for chips and fractures, while dental implants can replenish teeth that are entirely lost in a seamless fashion. Severe, chronic oral pain is typically caused by an advanced dental infection, although sometimes a stray piece of food or foreign debris may be the culprit instead. In order to rule out this possibility, we suggest that patients try flossing and rinsing first to see if that alleviates their discomfort. 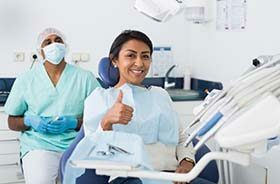 Root canal therapy may be recommended to remove diseased tissue from within the tooth and alleviate the infection, allowing patients to maintain their natural tooth in the process. If the damage is already too extensive, the tooth may need to be removed altogether with a professional extraction. We will walk you through your options in a clear, straightforward manner during your dental emergency appointment and help you alleviate serious pain right away. We understand – having to remove one or more natural teeth is never a service that patients look forward to, which is why the Santavicca Dental Professionals team works so hard to prevent this possibility from happening in the first place. However, there are situations where it’s the right choice for your continuing health and wellbeing, such as when advanced decay is present or a child’s “baby” tooth is impeding the arrival of the new adult one. Your comfort will always be at the forefront of our minds throughout the extraction process, which is why sedation dentistry is available upon request.